Helen began her journey with Employability Services when she undertook a voluntary placement as a Receptionist/Administrator, hosted by Tukes, NAViGO. Prior to this Helen had achieved a BA (Hons) in Psychological Studies, along with a number of ‘A’ Levels and GCSE’s. After gaining her degree Helen volunteered within North East Lincs Council and Foresight, where she enjoyed supporting service users. However, having gained many transferable skills whilst working towards her degree, she decided to embark upon an administrative career. 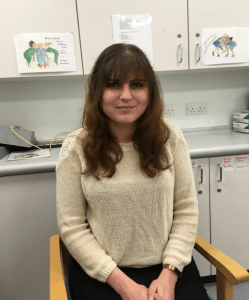 In December 2017, Helen was successful in gaining an Apprentice Clerical Assistant position within the Community Therapy Team at Cromwell Road. Helen worked hard to learn all aspects of the role which at times could be challenging and in doing so her confidence increased dramatically. Helen was delighted when she recently secured a permanent role within the team. Helen’s manager Chris Leak says, “Helen has worked hard and had a very successful year. It has been great to see Helen’s confidence grow throughout her apprenticeship”. Amanda Thomas, Apprenticeship Development Officer concurs with these comments and comments, “It has been a pleasure to support Helen throughout her apprenticeship as she has worked hard and deserves her success”. Amanda also adds, “Helen’s journey is a great example of how it is possible for an individual to change their career path via the apprenticeship route”.